Modern holiday home at the incomparable Omaha Beach. 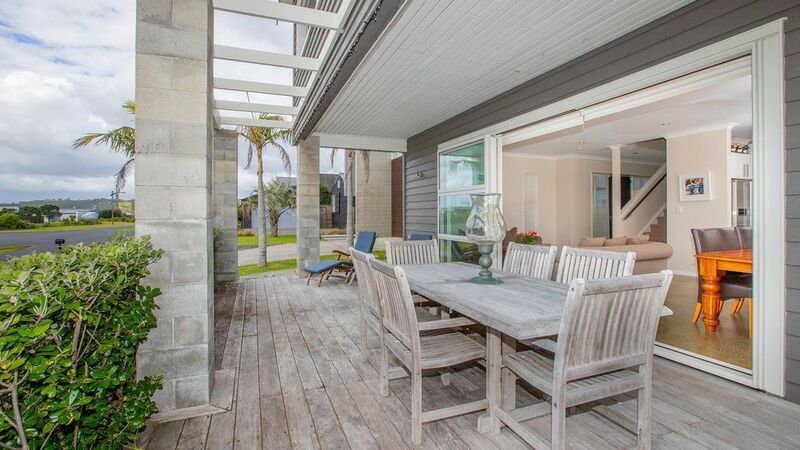 Less than 60 minutes from the CBD, Omaha enjoys a central Matakana position with markets, shops, beautiful beaches, vineyards, a range of restaurants, walking, cycling, local crafts and food all within close proximity. Stunning home decor. Our house is approximately 5-7 minutes drive from numerous wedding venues. I.e. Stables, Plume, Ascension. This home features 4 bedrooms; two have queen size beds, one with ensuite, one has a semi ensuite, private decks and sea views, making for an ideal holiday home for two families. The third bedroom has two single beds, the fourth has queen and king single bunks plus a single bed. The kitchen is a dream to create in, with Ilve appliances, wine fridge, large double door fridge/freezer and is fully equipped for entertaining and cooking. Nespresso coffee machine available for guests. Much much more than a basic kitchen. Living is open plan with the living and dining area being a comfortable and cosy area supplied with games and lots of books to while away those holiday evenings. The second living area features Stereo, 50 inch television with Sky, plus wood burning fire and air cond for Cosy winter evenings. Outside there are large private decks upstairs ideal for sunbathing or just to sit with a drink in the wicker chairs and watch the day wind down. Downstairs all rooms open to sunny decks with shelter from any breeze with dining tables and a large BBQ. An outdoor fire with wrap around seating plus an abundant supply of dry firewood is ideal to toast marshmallows or enjoy a glass of wine, it's a fabulous area. All this and an easy 4 minute walk to the beach which is patrolled during the summer months, golf course, launching ramp and the tennis courts. 3 x Golf clubs, and tennis equipment is supplied plus 3 adult sized bikes. A highchair and portable cot are available on request. 60 MINUTES NORTH OF CBD. Public Holiday weekends have a 3 night min. with Easter having a 4 night min. A bond is required equivalent to 1 nights accommodation either by cheque for bank transfer. We Built this home 8 years ago to our own design, planted a tropical look garden which has grown to provide privacy in the warm Omaha environment. OUTDOOR FIREPLACE WITH WRAPAROUND SEATING - 4 MINUTE WALK TO FABULOUS OMAHA BEACH. Our house is situated within a 7 minute drive from several wedding Venues. The Stables, 5 minutes drive from the Matakana Village. Indoor and outdoor wood burning fire. Plenty of wood available. Full linen provided at cost of $125. Two separate living area, downstairs is open plan. Basics I.e. flour, sugar, spices, etc. very well stocked. large matai timber table with 8 leather chairs. Long breakfast bar with 4 stools. Several tennis courts are close . Blue water Adventures in Omaha offer equipment hire plus lessons. On Saturday mornings there is a Farmers Market in Matakana, down under the cinema by the river. It's really worth the visit, it starts at 8.00 - 1.00 pm but pays to get there early as parking gets crazy later in the morning. OBV vineyard, which is about 5 mins drive from our house is nice for wine and simple platters, and on a clear day has spectacular views out to Little Barrier. Charlie's which is in Sharp Road, about 8 mins drive has delicious gelato icecream (they also makeup takeaway tubs) and I noticed the other week that they have a wood fired pizza oven out the back by the grapes. This may only open only during the summer months. Kick Back Cafe in Omaha by the surf club makes good coffee as does MMK down by the river next to the Saturday markets. Plume Cafe in Matakana on the roundabout have good coffee, meals and make nice bread on site. The Golf Club also have a cafe, and is nice to sit outside on their deck, has good views of the inner Harbour. There is a Countdown supermarket in Warkworth, approx. 15 minutes before Omaha or a Superette in Matakana and also a well stock one in Omaha by the surf club. The Sculpture Park in Matakana has recently opened and is getting rave reviews. Apparently its amazing and I can’t wait to visit. Its been 8 years in the making, also has a restaurant. www.sculptureum.nz/. We have now had lunch there, twice and is excellent. Goat Island is a Marine Reserve and also has a Marine Discovery Centre which is open 10-4pm weekends, public holidays and school holidays. Hire snorkelling equipment, loads of fish, and also a glass bottom boat. Tawharanui Marine Reserve is 15 mins drive from our house, a really lovely place for a picnic. Ti Point is a good walk around the point. Fishing Charters go from Ti Point Wharf. Slipray. Charters Ltd. Brick Bay has a sculpture trail and a nice place to sit and have a wine and a platter overlooking a pond and trail. Hope the above is helpful. Any questions please let me know.